When former Two-Division World Champion Bernard "The Executioner" Hopkins enters the ring this Saturday, May 21 to face WBC and Ring Magazine Light Heavyweight Champion Jean Pascal at the Bell Centre in Montreal Canada, he will be 46 years, four months and six days old, over a half a year (192 days) older that George Foreman was when he defeated Michael Moorer for the heavyweight championship on November 5, 1994. A win for Hopkins not only means becoming the Light Heavyweight World Champion again, but it also means he will break Foreman's longstanding record as the oldest fighter in boxing history to win a major world title. "This fight is more about history than redemption," said Hopkins. "I want to be known as the modern day Archie Moore. Moore also went up to Montreal when he was over the age of 40, faced a younger hometown favorite [Yvon Durrelle] and knocked him out. It means more to me to break the age record and prove that I am representing not just the older fighters, but older athletes in any sport." Regardless of the outcome of Saturday's fight, Hopkins is already among an elite class of athletes who have made statements in their respective sports well into their forties. 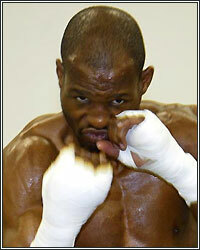 Hopkins' first victory at the age of 40 came when he defeated Howard Eastman on February 19, 2005. He followed that with wins over Antonio Tarver, Winky Wright, Kelly Pavlik, Enrique Ornelas and Roy Jones Jr.
"This is not just historically significant for boxing," said Oscar de la Hoya, president of Golden Boy Promotions and Ten-Time World Champion in six weight divisions. "This is history making in sports...period. For Bernard to perform at this level at his age is something to be honored, revered and noted by students of this game and sports fans across the board. Yes, we have seen great athletes compete into their forties, but for Hopkins to be 46 and competing like this is just incredible." "I am going to go out there on Saturday night and fight for all of the old guys out there," said Hopkins. "I am living proof that life isn't over at 40. I am leading by example to show that you can continue to do what you love well into your forties. My motivation is to get in that ring and prove to the young lion that the old lion still rules the jungle." Kareem Abdul-Jabbar (NBA) - The iconic L.A. Laker retired in 1989 at the age of 42 after helping lead his team to back-to-back championships in '87 and '88. At the time of his retirement, Abdul-Jabbar was the all-time leader in points scored, games played, minutes played and field goals made. George Blanda (NFL) - An all-time leading NFL scorer, Blanda played until the age of 48 (from the 1940s-1970s). He is still the oldest player to suit up for an NFL game. Brett Favre (NFL) - The 20-year NFL veteran is the first quarterback to have wins against all 32 NFL franchises and the only quarterback to throw for over 70,000 yards. In the 2009-2010 season, Favre became the first 40-year-old quarterback to win a playoff game when he led the Minnesota Vikings to victory over the Dallas Cowboys. Bob Fitzsimmons (Boxing) - Boxing's first three-division world champion, Fitzsimmons retired from the sport in 1914 at the age of 51. He is revered as one of the greatest punchers to ever step into the ring. Gordie Howe (NHL) - The NHL Hall of Famer is the only player to grace the ice into his 50s and to play in six different decades (1940s-1990s). After stepping away from the NHL at the age of 43, he returned nine years later at the age of 52 to play for the Harford Whalers, scoring 15 goals in the '79-80 season. Archie Moore (Boxing) - "The Old Mongoose" had one of the longest careers in the history of boxing. With 219 professional fights and the most knockouts in history (131), he won the light heavyweight world title at the age of 39 and continued to fight until he was 47 years old. Jamie Moyer (MLB) - As part of the 2009 World Champion Philadelphia Phillies, Moyer pitched a team-high 16 wins at the age of 45. Jack Nicklaus (PGA) - The most decorated golfer in PGA history, Nicklaus began amassing championship wins in his twenties. At 40, he won both the PGA Championship and U.S. Open. Nicklaus made history again when he won the Masters at the age of 46 and still holds the record as the oldest Masters champion. Richard Petty (NASCAR) - The winningest driver in NASCAR history, Petty drove in over 2,000 races during his 35-year career, winning the Daytona 500 twice after his 40th birthday. He retired in 1984 at the age of 47. Jerry Rice (NFL) - At the age of 40, the Hall of Fame wide receiver scored his two hundredth career touchdown and surpassed Walter Payton to become the NFL's all-time leader in total yardage. That same year (2002 NFL season), he helped lead the Oakland Raiders to Super Bowl XXXVII. Rice's 48-yard touchdown catch in the fourth quarter of that game made him the first NFL player to score a touchdown in four Super Bowls. Nolan Ryan (MLB) - Ryan threw two no-hitters at the age of 40 and amassed over 1,000 strikeouts in his six seasons after hitting the four-decade mark. He retired at the age of 46. Willie Shoemaker (Horse Racing) - In 1986, Shoemaker became the oldest jockey to win the Kentucky Derby. He was 54 years old. Dara Torres (Olympic Swimming) - At the age of 41, Torres swam her way to three silver medals at the 2008 Beijing Olympic Games. She is the oldest swimmer in history to be placed on the U.S. Olympic team. NOTE: If you have not seen HBO's "Face-Off: Pascal-Hopkins II," we invite you to do so by clicking on the link below. This five minute version of their face-to-face encounter is not to be missed. "Dynasty II: Pascal vs. Hopkins" is presented by Groupe Yvon Michel and Golden Boy Promotions and sponsored by Casino de Montreal, Videotron and Coors Light. The 12-round WBC, WBC Diamond and Ring Magazine Light Heavyweight World Championship fight will take place Saturday, May 21 at the Bell Centre in Montreal, Canada and will be televised live on HBO's World Championship Boxing beginning at 10:00 p.m. ET/7:00 p.m. PT in the United States and distributed live on pay-per-view in Canada on Canal Indigo, Bell TV, Shaw TV, Viewer's Choice and Sasktel in French and English beginning at 7:00 p.m. ET. A 12-round light heavyweight bout between former World Champions Chad Dawson and Adrian Diaconu will also be featured on the telecast. Dawson vs. Diaconu is presented in association with Gary Shaw Productions and InterBox. Tickets, priced at C$500, C$350, C$250, C$175, C$110, C$75, C$50 and C$35, are on sale now and may be purchased at the Bell Centre box office or by calling (514) 790-2525 or (877) 668-8269. Tickets are also available online at www.evenko.ca.